If you're like me, you relish your kitchen: it's that all important, all-inclusive multi-tasking domestic space where so many hours get eaten up with the delicious meals and tasty conversation that inevitably ensue within its hallowed walls. For so many people, the kitchen is an even more important room in the house than the lounge or living room (and if you really like to cook, maybe even the bedroom too). It is a space where we do so much more that merely store our produce and foodstuffs, chop and prepare; for many, it's where we unwind, relax, chat with friends, zone out to music, and let our minds wander as we indulge in a little therapeutic food-related activity. One thing that we can't seem to get enough of in the kitchen is space. Things can very quickly spiral out of control, and idle mess can become serious clutter in the simple flick of a whisk. Having ample space to wield your wares comes at a premium, so keeping everything in check is a foremost kitchen priority. 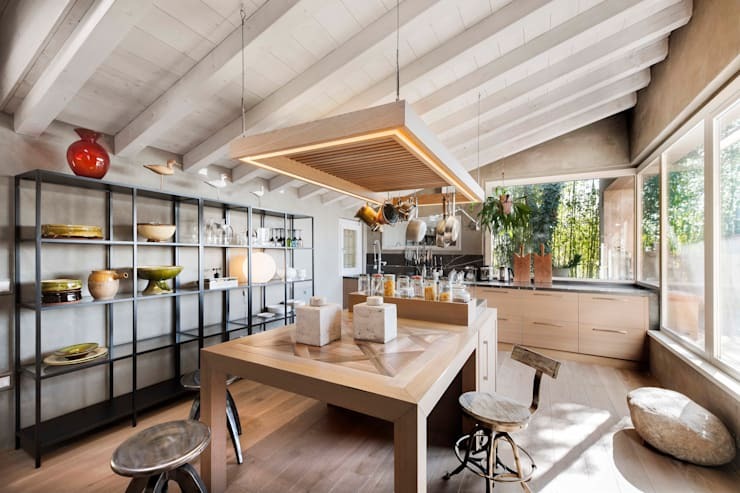 Even if you're far from being a kitchen aficionado and you actually spend the bare minimum inside the kitchen it still is important to keep this space in order. 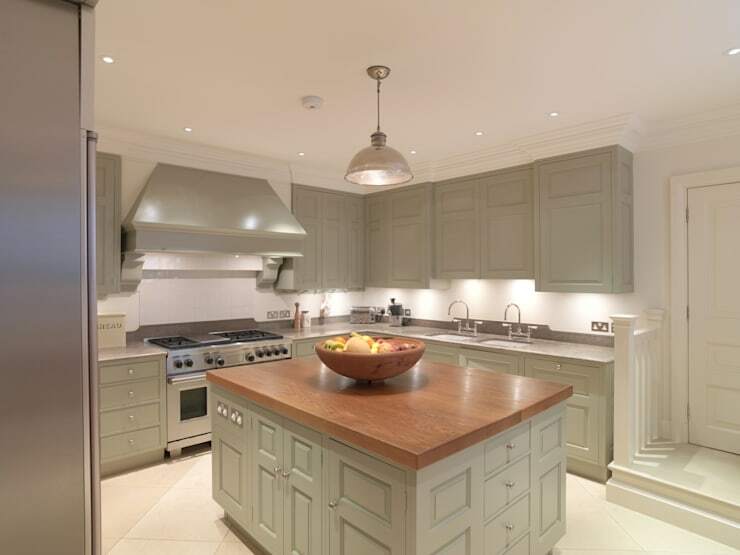 Today on homify, we're offering a few of our hottest tips on how to make the most of your kitchen space, and create more room within it, so take a wander through these neat examples and get cooking! Excepting perhaps the garage or shed, where else but the kitchen do we keep so many small and diverse bits and pieces? As the HQ of an endless array of cutlery, plates, saucers and exhaustive drawers and cupboards full of miscellaneous plastic measuring devices and appliances, the kitchen is, more often than not, a hotbed of 'stuff', prime candidate for potential clutter. Tip number one? Hang up what you can. Pots, pans and saucepans are bulky and take up a lot of cupboard space; additionally, the can very quickly get lost in a mire when they're tucked away in the dark recesses of said cupboards. The solution? 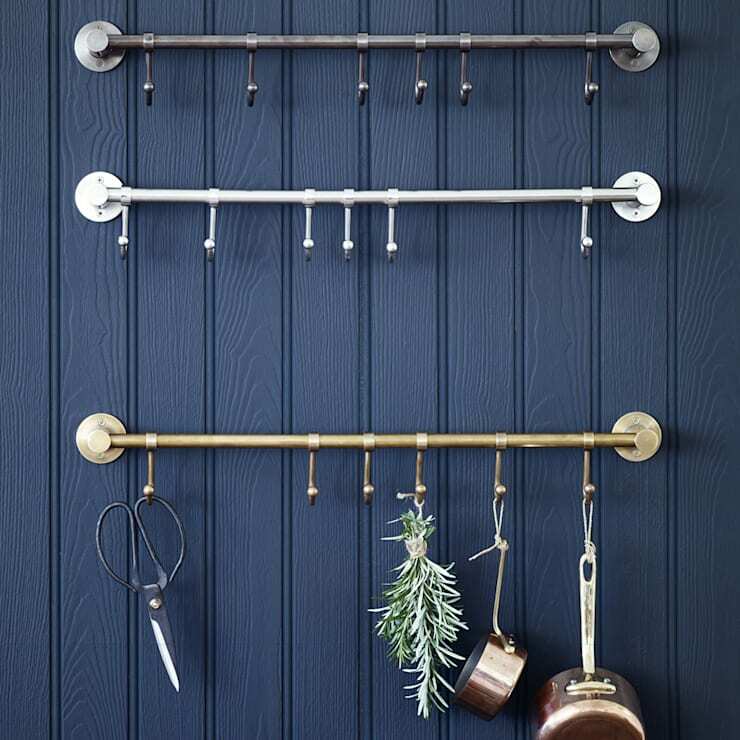 Take this neat example on board and consider setting up a trio (or more) or fabulous wall-suspended hook bars, great for hanging anything that'll hang, whether it's pots, herbs, scissors or beyond! 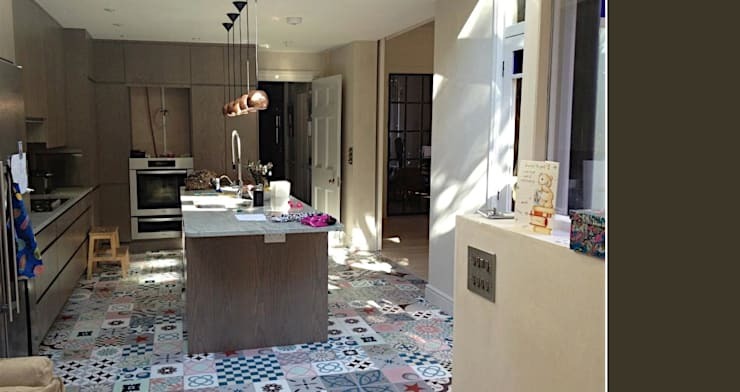 Unsure about how to work best with your kitchen space? Don't worry, you're not alone—for a little more advice and a few extra tips, why not chat to a professional about your own unique needs? Having a well stocked, yet even more well organised shelving system is one of the pivotal hallmarks of a well functioning kitchen. 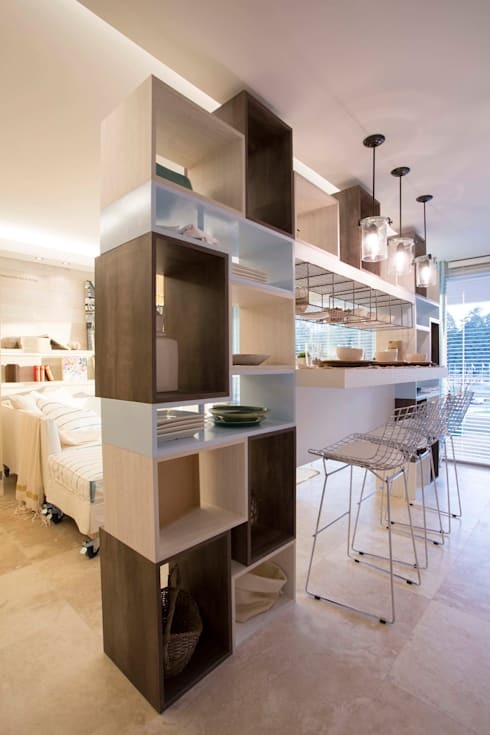 Yet sometimes, too much shelving can be a real nuisance when it comes to saving space: traditionally they can be rather bulky units, more cumbersome than helpful. However, with the right selection of shelving, you can ensure that all your things have a place to rest without taking up too much room. Look at this fabulous kitchen space: bright, open and airy, made all the more accessible, harmonious and free-flowing with the right choice of shelving—thin-framed, wall-lined, aesthetically easy on the eye—a unit that offers ample storage space for next to everything, without making the space looking cloistered and clunky. For the more boutique kitchen spaces out there, making the most of what you've got is central to a functioning, clutter-free kitchen. In some cases too, the furniture and fittings that we pick out for our kitchens (or ones that are pre-existing) may need to adapt and remain flexible multi-taskers. In this cute, aquamarine cottage style kitchen, the designers have certainly made the most with their space: in such a slender setup, with room only for a couple of floor to ceiling storage closets and cupboards, a feature wall cupboard becomes an indispensable addition—fine here for champagne flutes, mugs and tumblers, but something that could easily (and perhaps ordinarily) be used for food boxes, supplies and other edibles. Whether cupboard or pantry, small spaces thrive with clever multitasking, tailored always to the need. Speaking of multitasking, being clever with your storage spaces and how you use them can really make the difference between a happy kitchen and a messy one—especially when it comes to really tight spaces. Sometimes, we need to think a little outside the box; other times, we must get our hands on a few more boxes and think well and truly within them. That's certainly the case with this great example of tight kitchen living. With little in ways of floor plan between a kitchen and living area, this stacked box-style dividing wall presents a clever and economical space saving option. Serving the house with ample storage nooks, it also functions to section off the two areas without severing, nor compromising its airiness and overall livability. One of the best options for creating a kitchen with ample storage space is by setting the room around a central island bench. Island benches might take up a reasonable amount of floor plan, but they give so much in return: not just a robust bench in which to prepare food and meals, but a station where you can set up stools for a more social vibe, a place where friends and family can come together, chat and share each other's company around good food and good drink. It doesn't get much more apt than this fine example: rock solid kitchen island, freestanding like a monument, offering an abundance of space and daily expedience. Another kitchen, another island, but in this example we see the real benefits of what a freestanding island can offer: ample and very accessible 'hidden' storage space within. The more you can keep your kitchen tools and accoutrements out of sight and out of mind, the better off your space will be. Even if you don't have a kitchen island, you may have unexploited nooks and crannies simply pining to be turned into hidden storage. Take a look around, take good stock of your unique space, and you might be surprised what's possible. Did you enjoy that Ideabook? Why not take a deeper look into the world of kitchen design with a few tips for creating a classic country kitchen? Do you have any other handy space saving tips for our readers? We’d love to hear from you in the comments section below!